Following an extremely busy weekend of live broadcasting that included Pope Francis’ Visit to Ireland and a number of key GAA fixtures, TVM share some insight with IFTN about their involvement in the biggest live broadcast weekend since the 2016 Easter Centenary. Along with these events TVM covered a Triple Header of Ladies Football Semi-finals in Dr Hyde Park, Roscommon on Saturday, and the U21 Hurling Final in Limerick on Sunday evening, both live TG4. Last weekend between the Papal Visit and GAA TVM utilised 55 Cable Camera channels, 15 Radio Cameras, 27 Radio Talkback Channels and 258 channels of Audio. Over 21km of cable was pulled out over the various locations in Dublin, Knock, Roscommon & Limerick. All done with over 180 TVM crew and nearly as many hotel rooms. TVM continued their working relationship with the Irish Air Corps, with Pilot Commandant Jarlath Heneghan and Captain Oisín McGrath providing the live aerial pictures from Dublin. 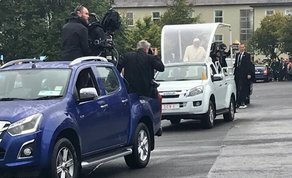 TVM were also responsible for designing the be-spoke tracking camera system that was used at Knock Shrine for the Pope’s tour through the people. The production team utilised an Isuzu DMax that was adapted by their in-house fabrication team and SteadiCam Op at TVM. RTÉ's television pictures of the visit was accessed by over 76 broadcasters worldwide and transmitted globally. Viewers in 159 different countries including Iran, Papua New Guinea and Swaziland accessed the coverage on RTE Player, RTE News Now App and RTE.ie. TV viewing data released by Nielsen TAM show that over 1.8 million viewers tuned in to RTÉ's special live television coverage of Pope Francis in Ireland across the weekend.